For most winter anglers, tip-ups are essential gear. Whether you want to cover a lot of water, try multiple baits and depths, or just increase the odds of landing fish while you jig in the comfort of an ice shanty, well-designed tip-ups are a reliable, effective fishing tool. From monster pike to plate-sized panfish, a properly rigged tip-up can help you catch them all. But to make them do the hard work you demand, you need some know-how and a clear picture of the best the industry has to offer. Which tip-ups work best in heavy snow? Should you really move to a thermal tip-up if you’ve had problems with freezing? Who offers the smoothest spool? These are all questions we can help you answer, and to get you started, we offer the following selection criteria and reviews. HT Enterprises Polar Tip-Up – Our Pick! 2.1 HT Enterprises Polar Tip-Up – Our Pick! 3 Our Pick- the HT Enterprises Polar Tip-Up! All tip-ups are designed to do the same basic things. They suspend a bait or lure through the ice and down into the water, holding their terminal tackle where the fish are biting. When a fish takes the hook, it triggers a flag to alert the angler. On most designs, that terminal tackle is held in place by a spool connected to a sealed, waterproof cylinder with a thin rod running through it. To prevent icing, this rod is bathed in a freeze-proof lubricant. At the bottom of that cylinder, you’ll find the spool positioned horizontally. As line is taken by the fish, the motion of the spool is transferred to that rod, triggering the trip bar and releasing the flag. Ideally, the spool and line should offer almost no resistance to the fish as it swims away with the lure and hook, preventing the fish from spitting the tackle. Instead, the fisherman approaches the hole, carefully retrieves the tip-up’s spool, and gently sets the hook before fighting and landing the fish by hand. What really differentiates the tip-ups we reviewed is the style of their base and the quality of their components. There are many styles of tip-ups. Some are perennial favorites, and others get very little love. We’ll cover the most common kinds you’ll see on the ice, assessing their strengths and weaknesses. Polar tip-ups are built around a rectangular base that secures them across the hole. 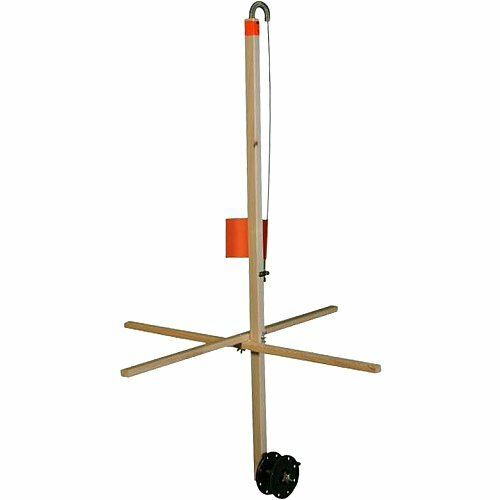 When rigged for transportation and storage, the cylinder and flag fold flat against this base, making them very easy to carry in a five-gallon bucket. When ready to fish, an angler simply lowers the cylinder and spool into place, forming a “T” shape. Polar tip-ups are extremely popular because they’re reliable, lightweight, easy to use, and durable when made with quality materials. They have two drawbacks, however. As they leave the hole exposed to the elements, the water can freeze, preventing the cylinder from spinning or trapping the tip-up in the water. Both mean lost fish. They can also be hard to see in deep snow, as they typically raise a flag no more than about 18 inches. Many experienced ice anglers swear by the best models, and they combat the icing problem with DIY tricks, like a patch of carpeting or styrofoam insulation. Thermal tip-ups are also very popular, especially where the mercury plummets to ridiculous lows. Built around a circular, insulated base, these tip-ups solve the freezing problem by protecting the water inside the hole. Sized to fit a 10-inch hole, they also stack neatly in a standard pale, allowing roughly half a dozen tip-ups to be carried easily. Many feature a small tackle compartment on their top, allowing you to store hooks and tiny gear inside them. Like their polar alternatives, however, they can be hard to see in deep snow. Pop-ups are a great idea, but modern designs aren’t maximizing their potential. As a result, they don’t get much love. In this design, the spool is mounted vertically and features a magnet. 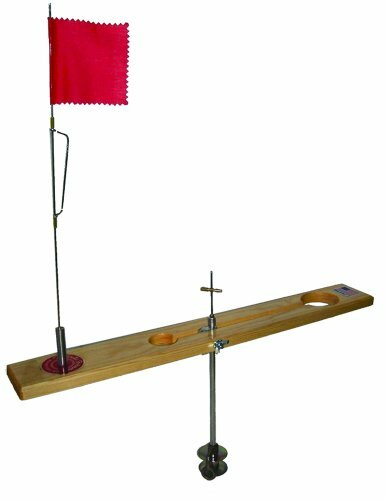 When the spool turns, the magnet’s movement trips a spring loaded flag. In theory, this is an awesome system, because it resists wind flags and rises far enough above the ice to be easily visible in deep snow. In practice, however, a serious problem bedevils this otherwise excellent design. Cylinder seal quality tends to be poor, allowing water to enter and freeze the spring. When that happens, the flag won’t trip. That can lead to disaster, and it’s a sufficiently common problem that causes many people to dislike the design. Another issue that’s less frequently discussed is the pop-up’s magnet strength. 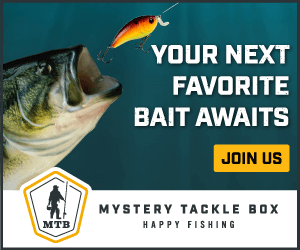 When fishing lake trout and pike, it can be difficult to use large live bait without tripping the flag, as the magnet system is simply too sensitive for this. We know that some people love this design, and if it works for you, we’re happy to say so! But these issues push us to steer clear of pop-ups, and none made our shortlist as a result. This design uses a plus-shaped base to suspend the cylinder below the ice. It works similarly to a polar tip-up, and folds down for transportation and storage. These are a bit bigger–and a bit heavier–than the alternatives, but they do offer one clear advantage. The cylinder is attached to a long vertical stick, and the flag height on these models is exceptional. If you regularly fish in deep snow and foul weather, cross-style tip-ups are probably the easiest to keep an eye on. Trip Bar – A well-made trip bar is essential. If it can’t prevent constant wind flags or is either too sensitive or too hard to trip, you’re going to miss fish and end up frustrated. We like trip bars with multiple settings so that it’s easy to adjust. Bait Clip or Line Guide – The bait clip prevents line from unspooling, acting like the bail on a reel. Good bait clips can open and close, allowing you to easily work with your line while your terminal tackle is attached. Flag quality – Flags need to be bright and durable. If they’re easily torn off by the wind or prone to freezing, you won’t be happy with their performance. Spool quality – Excellent spools are big, durable, and super-smooth. Size – Especially for larger fish like pike, you need plenty of line to let them run. 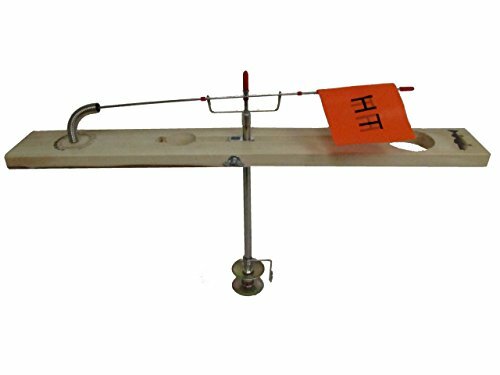 Moreover, you’ll be fishing some pretty stout stuff, and you need space for thicker-diameter, heavier test line. Durability – The best tip-ups feature spools that last decades, not seasons. Smooth operation – This is absolutely critical. The spool should let the fish have line with almost no resistance, unless you’re fishing a model that has drag and needs it. Test it by tying on a bit of line and pulling. Smooth as silk should be the feel. Really tough conditions favor some designs over others. Snow depth – Where tall drifts and heavy snow are common, you’ll be better off with a traditional cross-style tip-up. Temperature – If you regularly fish where frozen holes are a problem, you can either add an insulating layer to your tip-up or run a thermal model. Freezing is a serious problem for many ice anglers, and it’s common to see thermal tip-ups on the ice when the going gets tough. They can be a fantastic option, especially if you use smaller augers. With a 10-inch hole, however, they fall in and freeze to the sides, necessitating some hard work to free them. Generally speaking, we prefer to fish a polar or cross-style tip-up with some form of hole insulation, whether that’s an aftermarket product like the ThermaSeat or something you make yourself using carpet, rubber, or styrofoam. These additions do the job well and help you avoid the pitfalls of the thermal tip-ups. HT’s polar tip-up is perhaps the plastic-based model to beat. Built around a strong, 17.5-inch base, it was one of the first new-breed, lightweight tip-ups to win anglers away from wood. Its success can be credited to its smooth spool with excellent capacity. Indeed, two spools are available: one advertised as 200 feet and the other as 500 feet. What line capacity results in those measurements is anyone’s guess, but it’s safe to say–given the fan base the HT has won–that they offer plenty of line for the serious fisherman. 75 yards of 50-pound Dacron tip-up line shouldn’t be an issue on the larger spool, and you’ll rarely need more than that! A two-position trip bar makes adjustment a snap, and the bait clip is well-designed. Whether you’re angling for touchy perch or hard-hitting pike, you won’t be disappointed. Like other polar designs, the flag is the weak link on this system, rising to only about 18 inches. If that’s enough for you, you’d be hard pressed to find a better tip-up for a better price. Beaver Dam’s tip-ups are a legend on the ice, and we don’t say that lightly. They often serve as the comparison for quality assessments, and it’s not unusual to find anglers who are still using the same Beaver Dams they were fishing in the 70s or 80s! Built around a 23-inch pine base, they feature aluminum tube bearings and a stainless cylinder. These are well-sealed and will literally last a lifetime. Beaver Dam reports a 150-foot line capacity, but that’s meaningless without knowing the test and type of line they mean. But if generations of ice anglers are any indication, there’s plenty of space for the line you need. The spool on this model is the smoothest around, hands-down. Though they’re soldered in place, there’s no real need to ever remove them for additional lubrication. Flag quality is excellent, and when triggered, rises to 17.5 inches. If we have a quibble with the Beaver Dam, it’s on two fronts. First, the trip bar has a single setting–though experienced users know that it can be rotated to avoid the single position indent and allow for a very light trigger for panfish. Second, the bait clip is a simple, strong “eye” design that can be a bit hard to work with when tackle is attached to the line. Don’t expect the lightweight of plastic, but with that trade-off comes durability. You’ll never need to worry about cracking the base if it freezes to the ice. Keep in mind, though, that these legendary tip-ups are among the most expensive models we’ve reviewed. Frabill’s Dawg Bone Tip-Up is so-named because of the characteristic shape of its plastic base. Wide at the ends and narrow at the center, this unusual design has a lot of fans. In fact, it’s often mentioned as the single best base on the market. Lightweight and durable, they can be easily carried and stored, and they’re more than enough tip-up for most anglers. 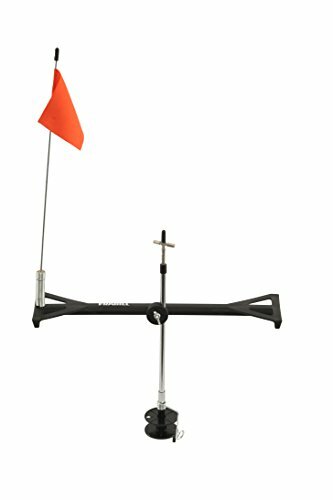 The trip bar on this model offers two settings, allowing for easy adjustment and avoiding wind flags on breezy days. The Dawg Bone’s spool is high quality and plenty smooth, though it’s not among the best of the models we’ve reviewed. Removable for cleaning and relubrication, it holds 50 yards of 20 pound test, which is more than enough capacity. Some users have had problems with flag quality–they can come loose as their adhesive fails. That issue notwithstanding, these tip-ups are an excellent buy and very budget friendly. 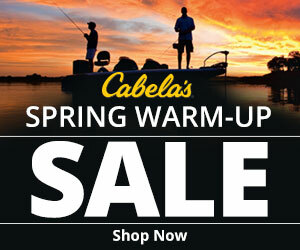 Frabill’s Pro Thermal solves the freezing problem that can ruin a day on the ice. Designed with a round, 10-inch base that’s insulated with thick styrofoam, this tip-up effectively protects the water in your hole and keeps the tip-up fishing no matter how cold it gets. Shaped to fit inside a standard five-gallon bucket, you can stack half a dozen or so without any problems. They also feature a cool storage compartment on their top for things like bobbers, hooks, and other small items. While not as smoothly spooling as the best of the bunch, there’s no arguing that these work in conditions that would freeze a polar tip-up. Offering a dual trigger bar, this model is also simple to adjust for either big bruisers or small panfish. The bait clip is easy to work with, too, which is a feature we really appreciate. As is the case with all Frabills, you can anticipate a removable spool for easy maintenance. But not everything’s awesome. Some users rightly complain about flag height, as without the extension, it’s roughly 13 inches off the ice. When using the telescoping feature, it lengthens to 20 inches, giving it more visibility than most of its competitors. But the solid flag is more prone to tripping in the wind than other models, irritating plenty of anglers. Worse still, if you use a 10-inch auger, this may not be the best model for you. 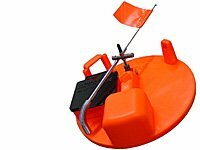 Despite what you might expect, this 10-inch product will fall into the hole, floating on the water. While that doesn’t sound too bad, it will then freeze to the edges of your hole in very cold weather, and chipping it free is likely to break it. Frabill’s Hardwood Tip-Up, like the Beaver Dam, is actually made from pine. You won’t need to worry about breaking its base, but it is heavier than plastic alternatives like the Dawg Bone. That said, since it’s built from high-quality components and designed to last, it’s an excellent alternative to its more expensive rivals. The Frabill’s spool is very smooth and plenty large. Dual settings make adjusting the trip bar a snap, and the bait clip is easy to work with. As with all Frabill tip-ups, it’s easy to clean and lube the removable spool. We’re generally impressed with these features, and if the quality edge goes to the Beaver Dam, the Frabill’s not far behind. 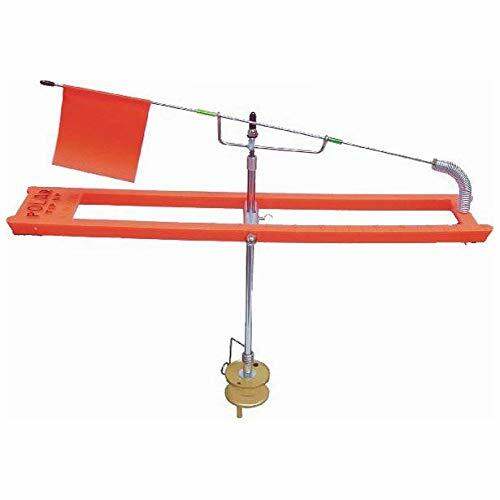 Like the Beaver Dam, this tip-ups sports a high-quality 17.5-inch flag. While perhaps not quite as durable as that legend, it’s less expensive and a trifle easier to use. More popular on the east coast than in the midwest, Heritage Laker Ice Traps are a seasoned design that’s ideal for heavy snow and big fish. Built from wood, brass, and copper, these tip-ups are made to last. Generations of fans will tell you that they can really take a beating, and like the Beaver Dams, you’ll find people fishing the same tip-ups for decades. One area where the Heritage Laker really shines is visibility. Standing fully 45 inches with its flag extended, you’re going to see this towering tip-up over the snow. Its spool is smooth and massive, holding no less than 500 feet of 36 pound test. That’s enough line for the biggest pike and lakers, and if you like to run your tip-ups for the big guys, you could do a lot worse. With that in mind, the Heritage Laker offers a drag system, helping you keep those monsters on your line. It’s also very resistant to wind flags. You do need to keep an eye on the wingnuts that hold this tip-up together, and be sure not to over-tighten the drag when using large live bait. As you’d expect, this is a big tip-up that isn’t as easy to transport and store as most alternatives. It’s also a bit pricier than many of its competitors. Like the Beaver Dam and Frabill Hardwood, HT’s Husky DLX is a design that’s basically gone unchanged for decades. And like these competitors, the Husky offers old-fashioned quality–a feature that never goes out of style. Its metal spool is very smooth, offering enough capacity for any ice angler. The Husky’s bait clip is easy to work with, and its trip bar sports two settings, making it easy to adjust. Its flag is well-made, too, and we’re really impressed with the overall quality of this tip-up. In our minds, like the Frabill Hardwood, this comes very close to the Beaver Dam in quality at roughly half the price! As is the case with all wooden tip-ups, the Husky is robust but heavy. And with its direct competitors, it shares a flag height that isn’t awesome, roughly 17 to 18 inches or so. HT’s Thermal Extreme is a direct competitor to Frabill’s Pro Thermal. As its rival does, it uses a thick, insulating layer of styrofoam to protect the water in the hole below it. Designed with a round base, you can stack these six deep in a six-gallon bucket. That makes storage and transport hassle-free, a feature we appreciate. Like the Frabill, the HT Thermal Extreme sports a tiny compartment on top, allowing you to stow bobbers, hooks, and other accessories on board. Like other HT tip-ups, two spool sizes are available: a 200-foot and a 50-foot model. 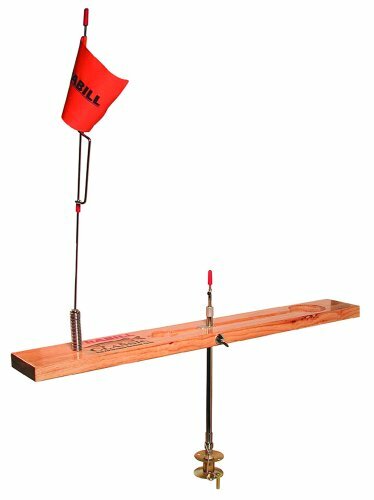 The test line used to calculate these lengths isn’t known, but as we’ve said before, the larger of the two can handle a lot of very heavy line, more than enough for lake trout and pike. The spool is admirably smooth on this tip-up, too, and the bait clip is well-designed and easy to work with. We see a competitive advantage over the Frabill if wind is a problem for you. In our experience, the telescoping flag on the HT is less prone to being triggered by the wind due to its design. 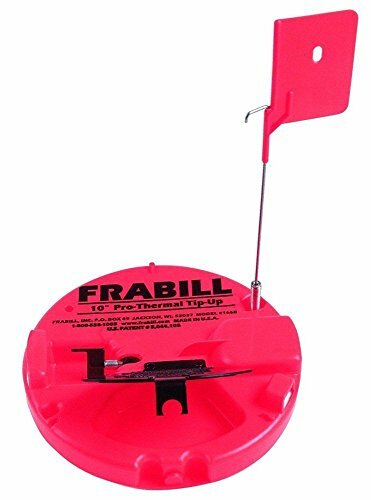 But like the Frabill, you really want to fish this tip-up over a hole that’s smaller in diameter than the base, as freezing will be a problem. Our Pick- the HT Enterprises Polar Tip-Up! There are a lot of excellent tip-ups on our list. Depending on your needs, the conditions you fish, and your feeling about plastic versus wood, any of these products could be a great choice. For instance, if you regularly face deep snow and gusting winds, we’d recommend the awesome Heritage Laker Ice Traps. And if money’s no option, the Beaver Dam Originals are really hard to beat. But the best all-around choice is probably the HT Polar. Lightweight, tough, and well-designed, what it lacks in old-fashioned aesthetics it makes up for in performance for the price. With two excellent spools available, no fish is too big. It’s also easy to use and light on both your budget and your back, allowing you to bring as many as the law allows onto the ice. Whatever your choice, you’ll be well-prepared with any one of these options. If it has fins, John has probably tried to catch it from a kayak. A native of Louisiana, he now lives in Sarajevo, where he's adjusting to life in the mountains. From the rivers of Bosnia to the coast of Croatia, you can find him fishing when he's not camping, hiking, or hunting.